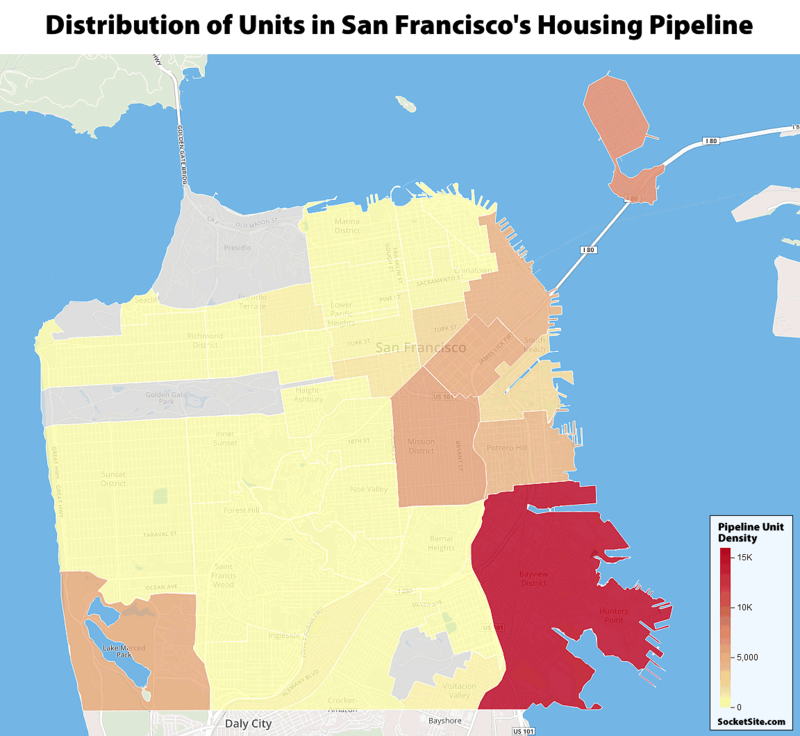 With the number of newly proposed units of housing to be built in San Francisco having outpaced the number of units that finished up construction in the fourth quarter of last year, the overall pipeline of apartments and condos under development in San Francisco has increased by 1,950 to a record 65,250. And having slipped on a year-over-year basis the quarter before, which was the first year-over-year decline since the end of 2014, the overall pipeline is now running 1,630 higher versus the same time last year. That being said, the number of units in approved projects which have actually broken ground, units which should be ready for occupancy within the next year or two, slipped by 300 to 6,275 and is down from a current cycle peak of 8,800 in the third quarter of 2015. At the same time, the number of units in projects which have yet to break ground has grown. 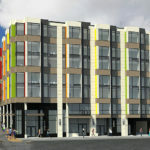 In fact, there are now 15,500 net-new units of housing for which building permits have either been issued, approved or requested – which is up from 12,400 the quarter before – along 29,100 units in projects that have already been approved but not yet permitted (which includes the majority of the 10,500 units by Candlestick, 7,800 units on Treasure Island and 5,680 units at Parkmerced, projects which have overall timelines measured in decades, not years). And with proposals for another 14,400 units of housing now under review by the City’s Planning Department, which is up from 12,850 the quarter before and bolstered by the anticipated passage of San Francisco’s proposed Central SoMa Plan, San Francisco’s Housing Pipeline now totals a record 65,250, including 11,270 units of “affordable housing” which are to be offered at below market rates, according to our accounting of Planning’s database as newly mapped above. Having a full pipeline is nice, but I’m more concerned with actual units built. This trend is unfortunate. It’s because construction costs are going through the roof. Due to NIMBY-driven, anti-housing policy, housing costs have skyrocketed — which, in turn, causes (construction) labor costs to rise. Rinse and repeat — and you’ve got the present “perfect storm”. How did you arrive at NIMBY-ism causing construction labor costs to rise? There is a lot of demand contractors and there are a lot of projects going on in the city simultaneously. The Central Subway is over budget supposedly due to difficulty finding contractors. The Transbay Terminal is delayed because they can’t find enough union electrical contractors. Anytime demand outstrips supply prices will rise, this includes both construction costs and housing costs. You’re correct that NIMBYism isn’t the only driver of labor costs, but it is a significant one. A survey of “developers, general contractors, architects and nonprofits in San Francisco” points out that “permitting and approval delays make SF projects less attractive to subcontractors.” Lots of approval and permitting delays are caused by NIMBY obstruction, and these delays drive up the cost of (subcontractor) labor. One needs to look at a longer timeframe to explain the current situation — not just what has happened over the past handful of years. NIMBY-driven anti-housing policy has been the dominant paradigm in San Francisco (and the greater Bay Area and throughout coastal California) for the better part of 4 decades. Accordingly, ever since the 80’s, as population has been consistently increasing, housing production has been declining in relation to this demand. This has created a persistent condition of housing scarcity and has caused housing costs to far outpace the COL — in an ever-accelerating fashion — to the point that we now have full blown crisis. The rise of NIMBYism and the onerous and counter-productive regulatory regime that it has spawned (and continues to feed) is the single largest cause of the disastrous decline in housing creation which, in turn, has led to outrageous prices. The cost of housing is now the largest single expense of the majority of workers — including construction workers — which in turn leads to higher local labor costs which make up the bulk of the cost of producing housing. This, I may add, is a problem throughout coastal California — basically wherever the good paying jobs are. In 1954, California had a population of 12.75 million and produced 207,903 units of housing that year. In 2016, California had a population of 39.25 million and produced only 100,961 units of housing. I’m all for building housing, but I’m not prepared to clear cut San Francisco to do it. Maybe try to turn your hometown around instead of expecting my already densely populated city to accommodate all of you. That said, there is an awful lot of new housing in the pipeline. Build it. But, eventually San Francisco will be built out. Then it’s time to build up Buffalo and Cincinnati. We can’t house everybody. There’s no doubt that NIMBYism affects development costs via legal battles, delays, etc. Even a relatively short delay for a project (say, five years) can create a sizeable impact on projected construction costs with increases in the cost of materials (e.g. lumber, steel, glass, etc.) not to mention inflation in wages via demand/shortages. @miraloma, what gives you right to call the city yours? This is not accurate. My sources in the trades tell me that not one call to the hall has been unfilled. The more accurate description is that the entire job is behind schedule because the job has been redesigned and reengineered during construction. Steel was a year behind, concrete still has about 10,000 yards to pour, and the fixtures have a 9 month lag after being released by the owner. Just to name a few. something in the neighborhood of 8,000 RFIs. Sounds like a sh*t show. So there are only 6,200 units of housing currently under construction in San Francisco while Oakland has nearly 7,000 under construction? Could this be true? In short, no. Your “under construction” number for Oakland is wrong and overstated by a factor of roughly two (2). It says here Oakland had over 6,700 units under construction as of December. We’d be willing to bet that your sources are incorrectly including every unit of phased developments, such as Brooklyn Basin, which have broken ground but not all pieces of which are under construction (in addition to cutting a couple of other accounting corners). Our numbers are clean. I’m sure the numbers only include the one building under construction at the 3100 unit Brooklyn Basin. There are at least 5,000 units under construction in the DTO/ Auto Row Area. Not including Temescal, Piedmont Avenue, Jingletown, etc. See that red zone on the map? That’s the real long term development play in the Bay Area, not Oakland. That entire area will transform much more than Oakland. And best of all, it’s still part of San Francisco, and is further benefiting from the new office and bio spaces opening up in south SF and nearby up/down the 101. That’s the future! There are actually fewer than 4,000 units currently under construction in the DTO/Auto Row Area versus “at least 5,000.” Your numbers are simply wrong. If EGonsalves is right, then good for Oakland. That would help keep Oakland a bit more affordable. It does seem like proportionally Oakland is doing better than SF. I’m confident in my sources. The media doesn’t want to confirm that for the first time in history Oakland has more housing units under construction than San Francisco. There is nothing wrong with that fact. This is great for our entire region and for our quality of life as well as for our environment. We wholeheartedly agreed that there would be nothing wrong with “that fact” (were it true). We simply have no confidence in your stated sources, at least in their ability to accurately account for projects which have approved versus permitted versus having already broken ground. Agreed. Other than Park Merced, we’ve concentrated new housing in places that are either formerly industrial, (gentrifying) low-income communities of color, or both. It’s more than fair to increase the density on the west side to both create some balance and boost production overall. Formerly industrial areas that no longer serves that purpose as well as former military bases are good places to build new housing IMO. Whenever you start tearing homes down to build taller structures things become a lot more dicey. There may be some abandoned retail that can be used to build housing on in the city’s western areas, but you don’t want to destroy good, existing housing – do you? There are plenty of parking lots, single-story retail and the like in well-to-do neighborhoods, from the one-story bank at 24th and Church in Noe Valley, to the abandoned gas station on Irving around 14th Avenue in the Inner Sunset. And yes, I also support replacing single-family homes near transit hubs with more affordable forms of housing for more people. Lisa Schweitzer, a professor of urban planning, makes the case for that better than I could. To clarify that statement, I support owners of single-family homes having the right to build multifamily housing on their land, with Right to Remain guarantees for their tenant if any. I am not advocating for eminent domain. This should be a change that’s allowed to happen gradually over time. I read her article and have to strongly disagree. Taxing people out of their homes is not the way to go – any plan that relies on forcing people out of their homes is wrong in my book; it is command economy and centralized planing at its worst. It is better to allow the conversion of abandoned stores, gas stations, PDR space etc. into current purposes like housing and office space. Trying to preserve PDR space where it can’t pay for that use is not helping anyone. I live in the western neighborhoods and the one project to densify (over an old motel and at the terminus of the Taraval) near me is now a huge unfinished hulk, up for sale, so obviously just wishing for it to happen or even getting it started, doesn’t mean it will happen. Some math isn’t adding up in the western neighborhoods. Unfortunate but may say more about the project team than the climate for new housing generally. It’s hard to know because that project wouldn’t be allowed in the vast majority of the western neighborhoods. 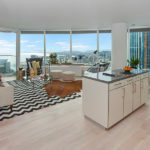 Do you have any stats or info on percent of rentals vs for sale units? And/or if the ratio of rental to condo has recently changed since the RE boom began (something like post 2010)? Not certain I fully understand your question…if you mean the number of proposed rentals vs. proposed sales, that can be a tough nut to crack as proposed condos can become proposed apartments after construction starts (like Tower Two at One Rincon Hill) as market conditions change during construction. I saw breakdowns of this in the past, as sponsors listed if they are selling or renting the units. Basically almost all new construction from the last boom of early 2000’s to 2008 was for sale condos. But probably over half of projects post 2010 were slated as rentals. I believe the financing and hence project sponsors were different between the two eras. Former being banks lending construction money, and wanting it back after sale. Latter was longer term money, and as rates were low and rents were high, it made sense for those institutional investors to “buy and hold.” I know they map condos anyways, but finishes will be different for rent vs condo, and they also need a transition plan, if going from rent to sale, so it’s a hassle to go from one to the other. Basically I’m wondering if today’s new new projects are going back to for sale condos from the get go. The numbers are a disappointment. Barely over 3K units/year and that number has only been achieved for a few years and likely will not be sustained. The Gold Rush city to the north has been producing 5K units/year for a number of years and will continue to do so for a number of years. A flyer for the mayoral race touted the candidate’s promise to produce 5K units/year. It does not explain how this person will do that. Typical platitudes. What the next mayor and board need to do is impose a moratorium on new office construction until a certain number of new housing units have been produced. Or, significantly slow office development until that time. Short of that the housing crisis will only worsen and draconian efforts by housing activists in response will not help the situation. Even more specifically, Supervisor Hillary Ronen made it a much touted core promise of her campaign to realize 5000 units of “affordable” — not just market-rate — housing in her District alone over the course of 10 years. Has anyone even heard a peep from Ms. Ronen on even a progress report on how she’s doing? Nope, just crickets. She should be asked about that. In public. This is just a transitory phenomenon. When price expectations change, there is always a disruption along the supply chain ( land owner, builder, sub contractors, workers, material supplier,…) But fundamentally, this is an region with some of the highest RE prices in the nation. And prices are at or near a peak, so supply wont shut off in the steady state until prices drop a great deal. No; it’s “baked-in” unless we do something about it. From the end of WW2 until the 70’s SF was quite affordable to the majority. During that 35 year period we were averaging 3200 units per year — all the while population was declining in the City. Since the early 80’s, however, NIMBYism has prevailed and it’s policies have consistently stymied housing production that is sufficient to keep up with increasing demand due to steadily-increasing population over the last 35 years. Unless we build more housing — a lot more housing — housing costs in SF are going to continue to be unnecessarily high. Economically-speaking, NIMBYism is corrupt/nativist “rent-seeking” behavior that disproportionately hurts the lower classes, young people and the newly-arrived — plain and simple. P.S. I forgot to add that from the 80’s until the present we’ve been averaging barely 2000 units per year. I am looking, and I don’t see how many units were completed last year… do you have a source that shows completions by year? It is good to have a lot of stuff in the pipeline, but if they just stay in the line it doesn’t make much difference. It has gone above 3K units last year and the year before IIRC. This and next year are likely to be above 3K. Beyond that it may fall off. Since 2000 the numbers have seriously lagged. Seattle, not yet quite as large as SF in population, is producing almost double the units. And it has no where near the housing and rent crisis SF does. The horses have gotten out of the barn IMO – this situation can’t be corrected. If Costa is repealed that will further dampen housing production in SF. IMO. New rental projects won’t be built. Have you ever been to Seattle? It’s much bigger in area than San Francisco and historically much less dense. South Lake Union and Belltown, where most new housing in Seattle is being built was all parking lots and one-story buildings. The only place that is really comparable in San Francisco are Mission Bay, Dogpatch and Bayview. Mission Bay is essentially built out except for Mission Rock. Dogpatch is filling up. That leaves BVHP and parts of Vis Valley. I say before we declare eminent domain over the West Side that we put the screws to Cupertino, Palo Alto, Brisbane, etc. I found a source through 2016 (page 6), no idea when the 2017 report is due (is this the report that SS is using?) Looks like 5000 units were added for 2016. The City’s Housing Inventory Report for 2017, the 2016 edition of which was released this past November, has yet to be published. Our reports are based on direct queries of the Planning Department’s database. So.. no housing being constructed in about 70% of the city? This map is unfortunately anti-correlated with access to transportation. Housing construction should be red hot down the SFMTA streetcar lines, and around BART stations. Instead it’s all on one side of the very end of the worst-served Muni line. Good point. We should be upzoning the areas with existing transit investments. Or add capacity to the T-line? As a former DC and NYC resident and daily transit rider, I cringe whenever I hear the word “streetcar” to represent SF public transportation. Anyway, the reason why development is on the eastern side of the city is because that’s where the land is to develop. We can’t get even minor improvements along existing rail lines and you expect upzoning in major residential areas? Even the new buildings going up on upper Market St. from Dolores-Castro are woefully short. You want upzoning then this would be the first place to start. 6 stories on a major thoroughfare is simply not good enough when the city is thousands of units behind. Can’t add capacity on the T because the $2B Central Subway is being built with 2-car maximum platform lengths. Also, that map will lead to very different supervisorial districts in a couple of years. The west side is the dormant home of NIMBYism, does anyone remember the litany that Park Merced went through to get their building permit? Just in time for the next correction. People have been saying it’s right around the corner for years. Waiting for a nonexistent correction is no way to plan. Prosperity is here, it’s not going away, and we should plan for it. Eventually, Sand Hill Road may tire of continually flushing billions of dollars down the terlet. Why they have not by now is a mystery to me. One reason they’re not tired of it is Dropbox’s impending IPO. Which is peanuts compared to Airbnb’s in a couple of years.